Prince Leopold of Belgium, Duke of Brabant, Count of Hainaut (12 June 1859 – 22 January 1869), was the second child and only son of King Leopold II of Belgium and his wife, Marie Henriette of Austria, and heir apparent to the Belgian throne. 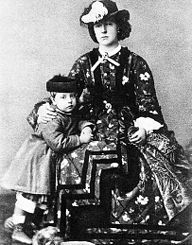 Prince Leopold with his mother, Marie Henriette in 1864. At birth, Leopold was styled Count of Hainaut, as the eldest son of the then-crown prince. At the time of his birth, his grandfather Leopold, formerly a Prince of Saxe-Coburg and Gotha, was the reigning king of Belgium. Leopold was preceded in birth by one sister, Princess Louise, and followed by two more sisters, Princess Stéphanie, and Princess Clémentine, who was born after Leopold's death, their parents' last hope for another son. Leopold became Duke of Brabant in 1865, upon the death of his grandfather and the ascension of his father to the throne. Leopold died at Laeken or Brussels on 22 January 1869 from pneumonia, after falling into a pond. At his son's funeral, King Leopold II "broke down in public, collapsing to his knees beside the coffin and sobbing uncontrollably." Prince Leopold's body was interred at the royal vault at the Church of Our Lady of Laeken in Brussels. Leopold's premature death left his father with only two daughters remaining: Princess Louise and Princess Stéphanie. After their son's death, Leopold and Marie Henriette tried to have another child, hoping for a son. After the birth of yet another daughter, Clémentine, in 1872, the couple abandoned all hopes of ever having another son and their already strained marriage broke down completely. Upon his death in 1909, Leopold II was succeeded by his nephew, Albert I, whose eldest son would later succeed him as Leopold III. Wikimedia Commons has media related to Leopold, Duke Brabant. ^ Hochschild, Adam (1999). King Leopold's Ghost: A Story of Greed, Terror, and Heroism in Colonial Africa. USA: Mariner Books. ISBN 0-618-00190-5.